Last October Pakistani forces freed a Canadian-American family held captive by militants, they also captured one of the abductors. Caitlan Coleman, an American, and her Canadian husband, Joshua Boyle, and their children were freed in an October raid after five years in captivity. Pakistani troops confronted Haqqani militants as they ferried the family across the tribal lands of northwest Pakistan. At the time United States officials saw a potential windfall in that the abductor was a member of the Taliban-linked Haqqani network who could perhaps provide valuable information about at least one other American hostage. When America demanded access to the man Pakistani officials rejected those requests elevating the event to another troublesome disagreement in the increasingly dysfunctional relationship between the countries. 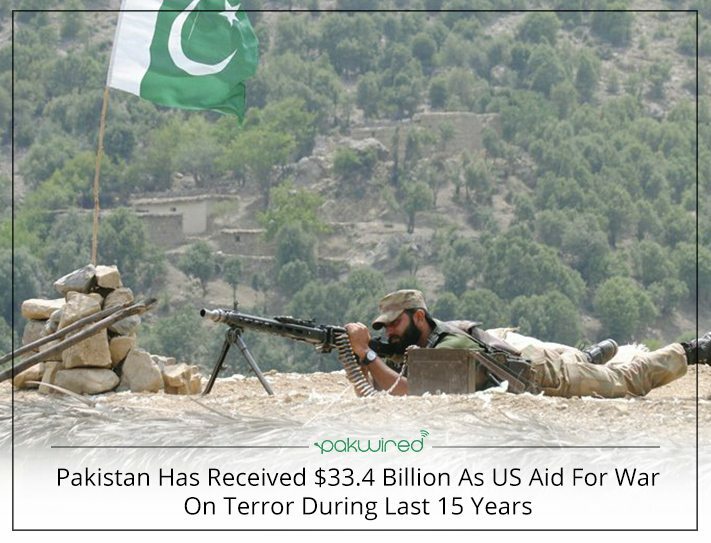 The United States has provided Pakistan more than $33 billion in aid since 2002, Just before Christmas Vice President Mike Pence reinforced the message of Americas's displeasure in a visit to Afghanistan when he told cheering American troops that “President Trump has put Pakistan on notice.” The reaction of his audience was notable since the Pentagon has historically been one of Pakistan’s defenders in Washington because of its longstanding ties to the Pakistani military. Afghan officials have pleaded with three American presidents to suspend nearly all security aid to Pakistan, an across-the-board freeze that would stop giving money billions to Pakistan, which is guilty of harboring the leaders of a Taliban insurgency that the United States has struggled to defeat. President Trump's recent action to halt almost all security aid to Pakistan suggests that his administration is carrying out the hard-line approach that he outlined in August. Trump's accusation that Pakistan has “given us nothing but lies and deceit” is driving this stand. The State Department has confirmed the suspension of security assistance including “coalition support funding,” which reimburses Pakistan for counterterrorism operations, and the Foreign Military Financing program, which pays for purchases of American military hardware, services, and training. Regardless of any knee-jerk reaction, it is important to remember the reason Pakistan is so important is that both it, and India it's neighbor to the south, possess nuclear weapons and that Pakistan is politically unstable. For now, the halt in aid is said to be "temporary" and affects about $1.3 billion worth of annual aid. The decision came three days after President Trump complained on Twitter about Pakistan’s refusal to crack down on terrorist networks operating there. All this underlines how swiftly relations with Pakistan have deteriorated since Mr. Trump took office and highlights several previous rifts between the countries over Pakistan’s role as a sanctuary for extremist groups which has poisoned Islamabad’s relations with Washington since the terrorist attacks of September 2001. Interestingly it was noted that the joy this move created in Afghanistan quickly turned to worry about how it might affect the rather complex war that has pushed the Afghan government to the brink. What is happening in Pakistan and that troubled part of the world should concern America. This includes rising tensions and military clashes in the Kashmir border region that have resulted in the death of soldiers from both Pakistan and India, this has dashed any faint hopes that the two estranged nations could soon normalize relations. Pakistan has also been experiencing a great deal of political turmoil following Pakistan’s Supreme Court removing Nawaz Sharif as prime minister last year for corruption allegations flowing from information that surfaced in the Panama Papers. Also, all indications are that Pakistan is turning hard towards Beijing and developing more ties with China as it pushes forward on its "One Belt One Road" initiative. Last but not least, top this off with Pakistan’s defense minister announcing that Islamabad will begin purchasing more weapons from China, Russia, and other Eastern European countries. A great deal of this is mixed in the weird and tumultuous politics of Pakistan which in many ways has made the country unstable. For example, near the end of November newly freed Pakistani Islamist Hafiz Saeed, accused of masterminding the 2008 assault in the Indian city of Mumbai, called on Friday ousted former Prime Minister Nawaz Sharif a 'traitor' for seeking peace with their neighbor and arch-foe India. Saeed has a USD 10 million U.S. bounty on his head over the Mumbai attack, spoke at Friday prayers after being freed earlier in the day from 11 months of house arrest by a court that said there was no evidence to hold him. Saeed was placed under house arrest while Sharif was still prime minister, a move that drew praise from India, long furious at Saeed`s freedom in Pakistan. Yes, a great deal of Pakistani politics seems to revolve around its difficult relationship with India. This sort of thing is why GlobalSecurity.org states that Pakistan's political system is broken: its political parties are ineffective, functioning for decades as instruments of two families, the Bhuttos and the Sharifs, two clans, both corrupt. Voting in Pakistan is intensely personal, with parties gathering votes primarily through allegiance to an individual candidate who is either feudal or has a proven ability to deliver services. Clearly, they have a point, here is a little background concerning the ouster of Sharif who has been ousted before. Sharif's government was dismissed over suspicions of corruption in 1993 by former president Ghulam Ishaq Khan and the military. He was elected again in 1997 but was overthrown in a coup two years later by the military that claimed he had tried to interfere with the armed forces. Sharif is the second world leader to be deposed by revelations in the Panama Papers that exposed corruption and hidden wealth. Sharif was re-elected in 2013, and his removal with a year to go in his third term continues a tradition. No prime minister has ever completed a five-year term in Pakistan since it became a parliamentary democracy in 1971. Pakistan is known for its multiple coups and has been ruled by the military for much of its existence since its independence from Britain in 1947. Attorney General Ashtar Ausaf Ali said Sharif was "disqualified for life," although the court did not explicitly ban him from running again. Pakistan is not due to hold elections until next year. In August of 2017, Shahid Khaqan Abbasi was sworn in as prime minister of Pakistan in an oath-taking ceremony. Abbasi was elected prime minister by lawmakers in the National Assembly earlier in the day to become the successor to the ousted prime minister until a 'permanent' replacement is elected. Abbasi is expected to be replaced by Shahbaz Sharif, who is likely to compete for the National Assembly seat lying vacant following the ouster of his elder brother and then stand for the chief executive's office. during his acceptance speech, Abbasi said, "I am grateful to the people of Pakistan, and I am grateful to the 'people's prime minister', Nawaz Sharif," he continued. "I am also grateful to the opposition and Imran Khan for remembering us in their daily slandering," he jibed. This means the former prime minister is already out there bashing his opposition and commenting on the events impacting the country. Following the dust-up with America, he urged Prime Minister Shahid Khaqan Abbasi to devise a strategy to make the country self-sufficient and independent of the need for US aid. Sharif described as "disappointing" U.S. President Donald Trump`s accusation that Pakistan was granting "safe haven" to militants Washington was hunting in Afghanistan. "Pakistan has been involved in somebody else`s war for over 17 years. The country has suffered the brunt of the damage the world has seen since 9/11," Sharif said. 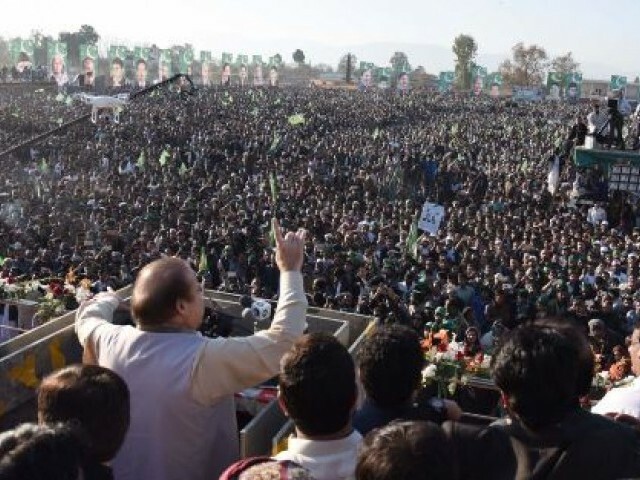 In January while addressing a gathering in Haripur, Sharif repeated his sharp criticism of the judiciary and attacked Pakistan Tehreek-e-Insaf (PTI) Chairman Imran Khan. For many Pakistan watchers, a big concern is that the country is moving in the direction of forming deeper bonds with other countries and lessening American influence in the area. Following the U.S. decision to cut nearly all American security aid to Pakistan, the country’s defense minister announced that Islamabad will begin purchasing more weapons from China, Russia, and other Eastern European countries. “We have a long relationship [with the U.S.], and we want to keep it,” Khurram Dastgir Khan assured Bloomberg in an interview saying that his country would, nonetheless, increasingly acquire weapons from countries other than the U.S. This comes at a time when Pakistan has been increasingly turning to China for military aid. Beijing is now building an offshore naval base near a strategic Pakistani port. Experts say it is typical for Pakistan to turn to other world powers when its relationship with the U.S. sours. “In the past when the U.S. has suspended military aid to Pakistan, such as following the 1965 India-Pakistan War and again in the 1990s because of the Pakistani nuclear program, Pakistan saw relations with other major powers, especially China, as a means of procuring arms and military equipment,” Harrison Akins, a security expert at The Howard Baker Center for Public Policy, told Newsweek. “In the current situation, it is the Trump administration’s behavior that is a distinct break from past patterns in this relationship, as it suspends aid and publicly rebukes Pakistan’s duplicity simultaneously with the ramping up of U.S. forces in Afghanistan,” he continued. Akins also noted that the U.S. usually adopts a pragmatic view of its relationship with Pakistan and only rebukes the country when it is disengaging from South Asia and therefore needs Pakistan’s support less. The ambiguous and confused history of relations between the US and Pakistan is a clear example of the politically realistic view that in international politics, every state is motivated by its national interest which is frequently concealed as a moral concern. There is no friend or enemy when it comes to the national interest. Diplomacy, deterrence, bilateralism, multilateralism and blame-game tactics all provide areas for these interest grounds for these interests to surface. In terms of strategic geopolitics, President Donald Trump's Afghanistan policy and his criticism of Islamabad on the issue of terrorism marks a clear line of conflict between the U.S. and Pakistan. Trump's allegations against Pakistan and his support of India as a strategic ally on both security and economic fronts has caused grave concern in Islamabad. Pakistan's cool welcome for visiting U.S. Secretary of State Rex Tillerson in October indicates Islamabad's grievances over Trump's Afghanistan policy statement. Too many politicians each day confirms that going forward economic ideologies and economics trump past alliances. Economic prosperity, sustainable development, and resource exploration have become increasingly important factors in a country's ability to retain its national integrity. 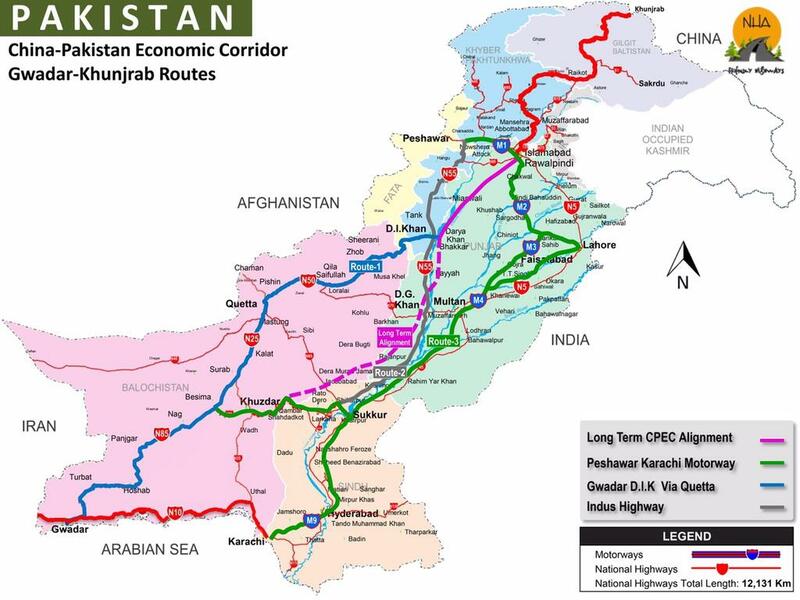 With the One Belt Road Initiative (OBOR) and the China-Pakistan Economic Corridor (CPEC), it appears those guiding Pakistan forward see strengthening their strategic and economic ties with China will help Pakistan reduce its dependency on the U.S. and its allies in the West. 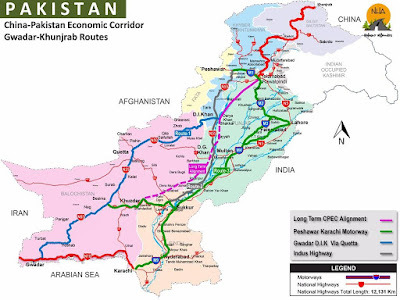 The ambitious OBOR development strategy China unleashed in 2013, has already resulted in investment projects that include thousands of miles of highways in Pakistan, an international airport in Nepal and a rail link between China and Laos. Couple this with the criticism flowing from Washington and we can understand why Pakistan clarify its relationship with the U.S.
Footnote; In coming days I will be posting an article about China's One Belt Road Initiative (OBOR) and some of the ramifications we can expect as it unfolds. Pakistan seems like a very bad neighbor to have, so I do feel sorry for India in that regard. Pakistan is majority Muslim, and when you have lots of fundamentalist Muslims, that creates all sorts of problems, including being sympathetic to their Taliban brothers. It seems like there is real contention in Pakistan between more moderate Muslims and the hard liners. Regarding China and their One Road Belt initiative, I really look at that with a very skeptical eye. How will they afford to build such a massive undertaking given the extreme terrain in that part of the world? Granted, there are tons of people in Pakistan, but Nepal has maybe 30 million? Will the One Road go to India as well? India doesn't seem to be a big fan of China. Does China really think that they will receive as much revenue from those countries as it does from selling products to Western nations, who have far higher disposable incomes per capita? I don't think that the average Pakistani, or Indian, or Nepali will be buying a new top of the line iPhone or android phone every year like in America. I am not convinced that China will ever make back the investment in such a project, and let's not forget that sheer amount of maintenance such a project would need. I suppose we will see what happens, but personally I think they will greatly overextend themselves. Amazon To Compete With UPS And FedEx, Seriously? Is It Too Early To Call A Market Top?